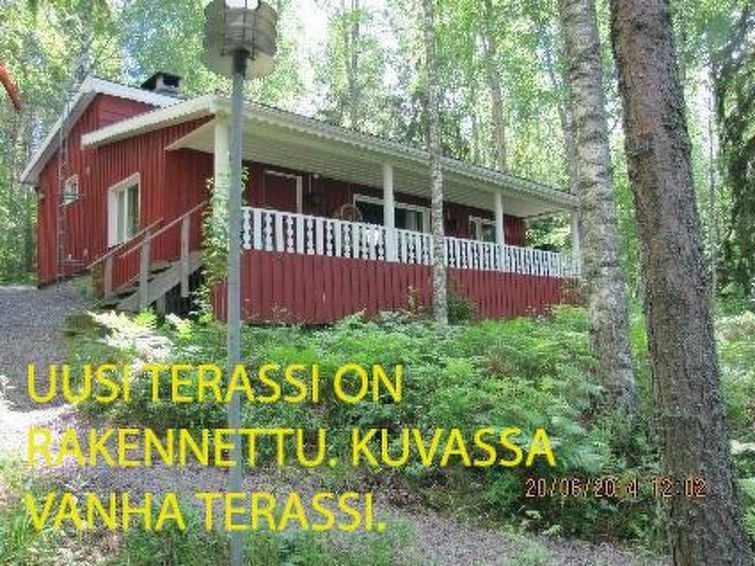 45 km north of Imatra, Lake Saimaa/Kurkilahti bay 35 m, soft, low-clay bottom, own boat.Wooden cottage 1988, renovated in 2008-2010, kitchen, living room, bedroom with a double bed, bedroom with bunk bed, bed room (only folding door) with double bed, sauna, shower room, wc, walk in closet, terrace (30 m²). Kitchen and living room are on two different levels.Air source heat pump.A separate lakeside sauna made of logs 1963, 12 m², sauna with cauldron, dressing room, electric lights, carrying water from a well 10 m, to the beach 10 m.In addition outside toilet. Garage, wood shed. Outdoor storage occupied by the owner. A nice place by lake Saimaa. A sunny hillside plot of 3000 sqm. Smoking oven and a campfire site. Canoe for free use. Quiet cottage road to neighboring cottages (4) 10 m from the cottage. Air source heat pump. Käyhkää channel 2.5 km and by boat 1 km, Kukonharju channel 16 km and by boat 7 km, ski center Free-ski 22 km, Suikkala dance place 30 km, Puumala 27 km, Svetogorks 55 km, a water park in Imatra 45 km, FK-lane 37 km, Imatra rapids 50 km, Lappeenranta 80 km.